Today’s market is flooded with products targeting elderly consumers and their children. They promise to make senior living more enjoyable, offer peace of mind, and promise more independence for both aging parents and their children who may have children of their own to care for. Few products deliver, but Independa is one that you could truly say is life-changing. As evidence has shown, more and more seniors wish to spend their twilight years at home. Independa is one such service that makes remaining at home more of a possibility, and a pleasant one at that. 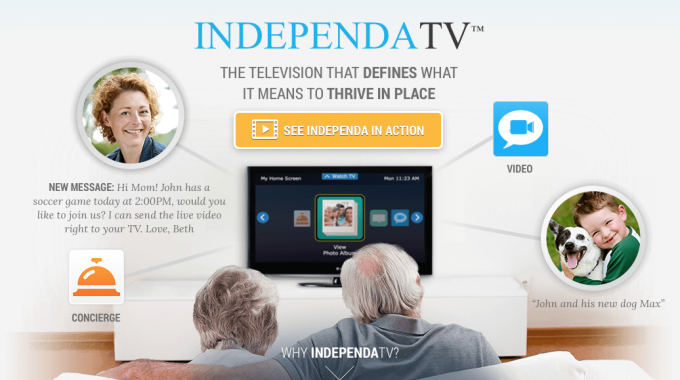 Independa is a platform that allows seniors to engage with family, friends, and caregivers through video chats or instant messaging directly from a TV screen using nothing but a TV remote control. The easy-to-use interface makes keeping in touch with loved ones accessible and not a chore. Photos can be shared directly on the TV, and video chats are right at your fingertips. The key is, this is technology everyone is comfortable with, and if you can use your remote control, you can use Independa. Independa is practical, too. Caregivers and family can set up reminders that pop up on the television screen. This is useful to remind parents to take their medications or remind them when their grandchild’s soccer game is. The platform also features a call button service, which makes it a smart choice for caregivers, if seniors have an urgent but non-emergency need. It offers their platform on a special integrated LG SmartTV as well as on their brand new Independa AnyTV Companion™, a candy bar-sized device that allows any TV with an HDMI connection to become Independa-enabled. Recipients can use the Independa AnyTV Companion™ with their current TV or pick between three different TV screen sizes: 42”, 47”, and 55″. All features can be accessed directly from a specialized television remote. It is an intuitive design that is no more difficult than changing a channel. In fact, users can easily switch between Independa services and their regular TV programs, without changing inputs or going to a special channel. Simplicity is key. One of the challenges of caring for seniors is maintaining a connection with them. While families may not be readily available to visit, whether it be because of distance or other reasons, this is where home care steps in. What Independa offers is a way for caregivers to communicate with their clients, even if it isn’t a visit day. Whether it be via video chat, instant message, or simply helping clients with their built-in day-planner, Independa is the home base that caregivers can rely on. Caregivers and family can access their account on a computer or on the go using the free Independa mobile app. The app boasts an interactive calendar, a med reminder, multiple social engagement features, Life Stories™, and an integrated journaling feature, and health data integration. These helpful tools would be an effective way that a home care business could reach out to their clients anytime, anywhere, and receive valuable feedback. These features also retain value to clients as they allow them to interact and communicate with their home care provider like nothing else could. By partnering with Independa, home care businesses can expect their clients to be more satisfied with their care and enjoy an increased quality of life. Independa is a quality product designed to be intuitive for all parties to operate. While buying the required SmartTV could be a little pricey for some, you are essentially purchasing a brand new LG television that incorporates the latest technology of today, but it comes embedded with Independa to enable remote engagement and care for a loved one. It’s like buying a new TV with a plethora of useful features built in, a two-for-one deal. For those who would like to keep their current HDTV, Independa has launched their new AnyTV Companion™, a small device that gives you Independa features on your current TV while keeping cost low. The ability to access so much technology in a familiar medium such as a TV is brilliant. You can’t argue with it’s simplicity and accessibility. Did I mention, simplicity is key? While there are many elder care related apps and software out on the market today, and we can expect more to come, Independa remains unique as a thought and technology leader. Because it connects something familiar, like a television, with modern app technology, it is more accessible than other alternatives. For more on pricing and availability visit their shop.